Although I am relatively new to the kombucha trend, I have fallen head over heels pretty fast for the fermented tea beverage. 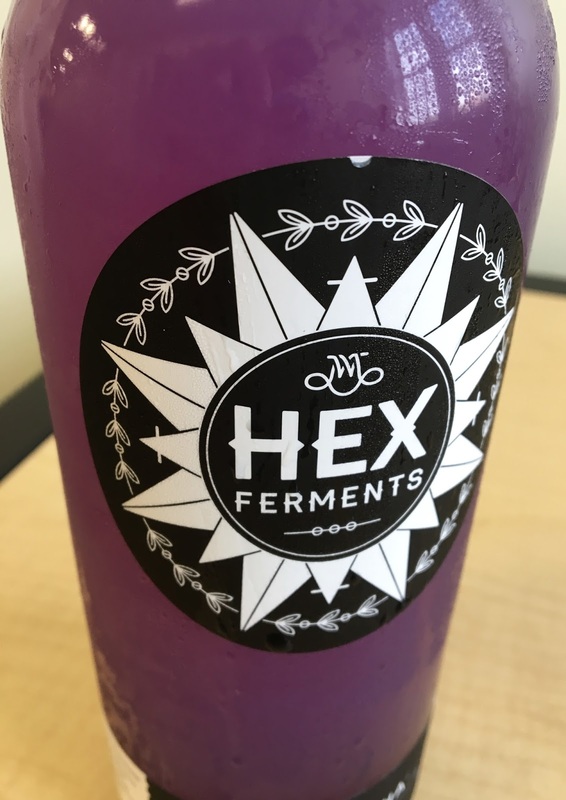 Although I have tried many store-bought varieties, a recent stop through Belvedere Square Market was cause for me to acquaint myself with Hex Ferments, a Baltimore-based local company turning out small batch fermented products. Though their main brewery is in Belvedere Square Market, Hex Ferments can also be found at local farmers markets in the region, including my favorite: the Waverly/32nd Street Farmers Market. Hex Ferments sources from local and organic farmers, ensuring their products start from top quality ingredients. 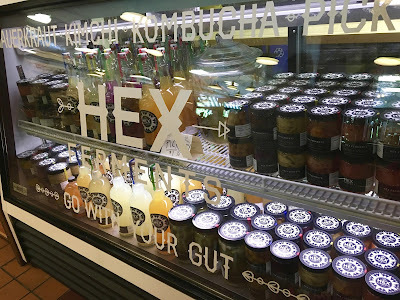 Unlike some store bought products, Hex Ferments uses old world processes- without heat or vinegar- to preserve the healthy benefits of fermented foods chock full of healthy probiotics. 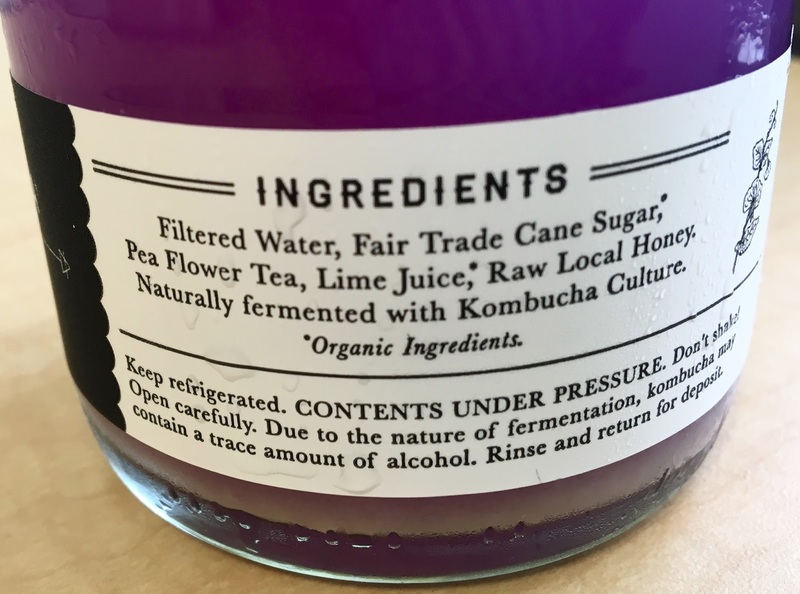 Because I am all about kombucha, this review is singularly focused on Hex Ferment's beverages. To learn more about their krouts, pickles, and kimchi, click here to check out their website. 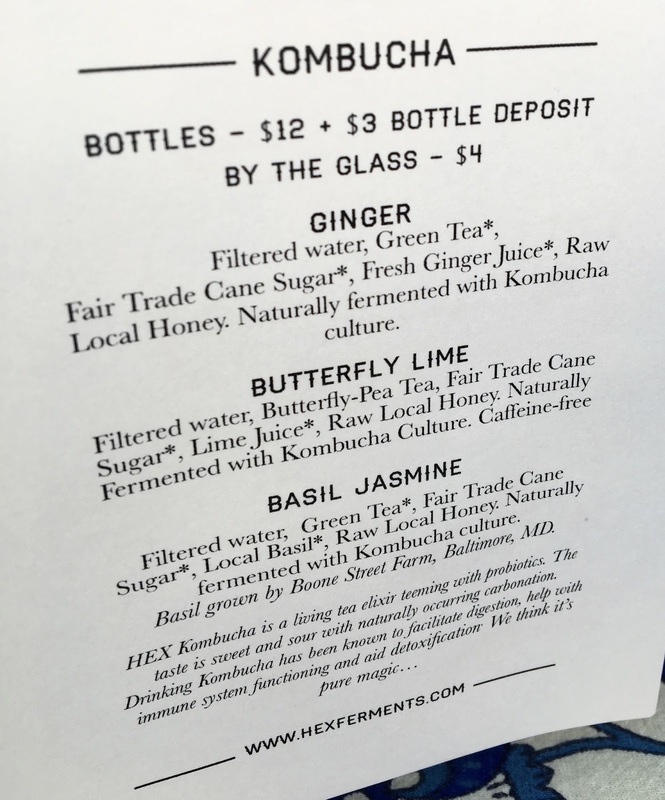 Hex Ferments' komucha is sold in tall, 25.4 oz (750 mL) bottles. One bottle easily gets me through a week. On initial purchase, an additional bottle deposit is charged, but this fee is eliminated by bringing back empty bottles to Hex Ferments to reuse (don't worry- bottles are sanitized before reuse!). There are typically a rotation of familiar flavors that are always available at farmers markets and at their Belvedere Square Market, but seasonal varieties do pop up on occasion. My initial purchase was the beautifully hued and totally addicting butterfly lime kombucha. Made with caffeine-free pea flower tea and naturally sweetened with raw local honey, cane sugar, and lime juice, the brew is free from artificial ingredients and unnecessary additives. The shelf life for a bottle typically ranges a couple weeks, so there's plenty of time to savor each brew. Butterfly lime is sweet and a little sour, and unlike any other kombucha I have tried before. It is refreshing and bright, but not overly sweet, a perfect beverage for a mid-afternoon pick-me-up. For the sake of a review, I had planned on trying another variety of kombucha from Hex Ferments, but couldn't bear bypassing butterfly lime. I have already incorporated Hex Ferments on my weekly farmers market priority list, and love interchanging bottles every week to have a constant supply of fresh, local kombucha. I am looking forward to sampling around their menu more, and acquainting myself with more of Hex Ferment's brewed beverages. Where to Find Hex: Click here to see a listing of markets, restaurants, and online grocers in D.C. and Maryland that stock Hex Ferments.